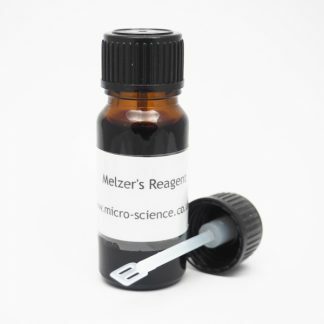 Melzer’s Reagent. 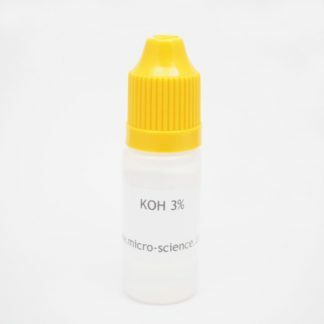 An iodine-containing solution widely used for the staining of polysaccarides on spores and hyphae. Especially useful for the visualisation of ornamentation on Russula spores. 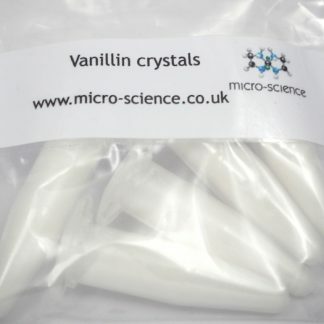 Supplied in a glass bottle with spatula for accurate application. Please note: we only deliver this item to the UK and Europe. Orders from the USA will be cancelled and refunded. Melzer’s reagent was first described in 1924 by the mycologist Václav Melzer. A simple preparation can be made by adding fungal tissue or spores to a drop of Melzer’s on a microscope slide. One of the following reactions will be seen with the naked eye. 1) Amyloid reaction – the material reacts blue to black. 2) Dextrinoid reaction – the material reacts brown to reddish-brown. 3) Inamyloid – the tissues do not change color, or react faintly yellow-brown. a) Euamyloid reaction – the material turns blue without potassium hydroxide (KOH)-pretreatment. b) Hemiamyloid reaction – the material turns red in Lugol’s solution, but shows no reaction in Melzer’s reagent. When KOH-pretreated it turns blue in both reagents. Baral H-O. 1987. Lugol’s solution/IKI versus Melzer’s reagent: Hemiamyloidity, a universal feature of the ascus wall. Mycotaxon 29:399–450. 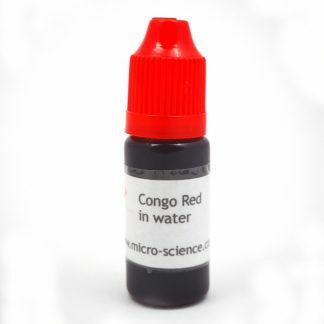 Place a drop of reagent on a microscope slide. Scrape a barely visible amount of Russula spores on to the tip of a needle, toothpick or scalpel tip and mix with the reagent. 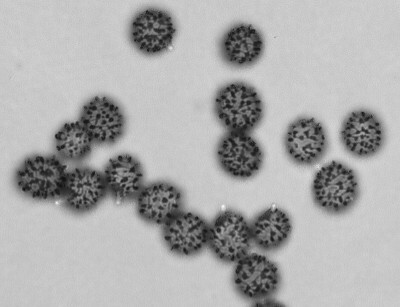 Carefully place a coverslip over the solution, at a slight angle to avoid bubbles getting trapped, and observe at high magnification (x1000) using a biological micrscope.